Is a Hardwood Floor Right for Your Bathroom? Hardwood flooring is a popular surface covering material that has been used in a variety of interior spaces since the dawn of modern construction. It is durable, low maintenance, long lasting, and has a beautiful natural look that is prized by many homeowners. However, it does have issues when used in moist or humid environments, such as bathrooms. While certain types of hardwood flooring can be successful in bathroom use, it will require a higher level of maintenance than in other places. Finish: In its unprotected state, hardwood flooring will plump, expand, warp, and stain at the touch of any liquids, because wood is naturally a very absorbent material. However, the application of a finishing agent, usually a polyurethane-based sealer, can create an invisible surface over the wood, making it impossible (or at least difficult) for water to penetrate. This finish will generally have to be applied several times in a bathroom, with special attention to the seams, since this is where moisture is most likely to infiltrate. It is very important that you choose a quality finish that is designed for water-heavy environments. There are some finishes that are marine-grade, suited even for outdoor all weather applications. Others will be acceptable for indoor use in damp spaces, though not fully waterproof. You also have to be aware that the sealer will only protect the top of the material; any water that penetrates down through the seams can cause damage to the wood from the sides and below. Type of wood: There are many different types of wood that are available for flooring installations, and some will be better than others at handling bathroom conditions. Generally, you should avoid softwoods such as pine and fir, as they will be less dense and more apt to absorb moisture. Good hardwood choices include teak, oak (especially white oak), cedar, cherry, maple, ash, walnut, and hickory. Warranty: Most hardwood flooring will come with a set warranty that will guarantee replacement over a certain period of time if the material fails. However, these warranties often come with stipulations that void them if the floor is installed in a water heavy environment, such as a bathroom. Always read the product literature carefully if you plan to install it in a bathroom or other damp area. Spills and splashes: This is going to be the first concern of any flooring installed in a bathroom. Showers and baths naturally tend to cause splashes. Even just rinsing your face in the sink can send droplets of water spilling out across the floor, and a bathroom with a shower or tub is almost certain to see water on the floor occasionally—especially a bathroom used by children. While the finish will protect the material to some extent, you still need to wipe up any spills immediately so that the moisture doesn’t wear away at the material's protective layer or seep down between seams. Sloped floors: If your floor is not perfectly level, you're going to have a problem with water sliding down towards the low areas and puddling.These puddles of moisture can be very damaging to the floor, and can even weaken its structural integrity—mostly because the water seeps through seams. Lack of moisture barrier: Many hardwood floors are installed by nailing planks directly to the subfloor, which means that a traditional vapor barrier can't be used since the nails would puncture it. If moisture seeps down past the surface, it can get to the structural components of the floor and start eating away at it. For this reason, hardwood flooring products that are installed with adhesive or click-together methods are better suited for a bathroom setting. Flooding: This is a constant threat in a bathroom, but the dangers are exacerbated when you have hardwood flooring. If a pipe starts to leak, or a fixture malfunctions, you can very quickly find the bathroom filled with inches of water. 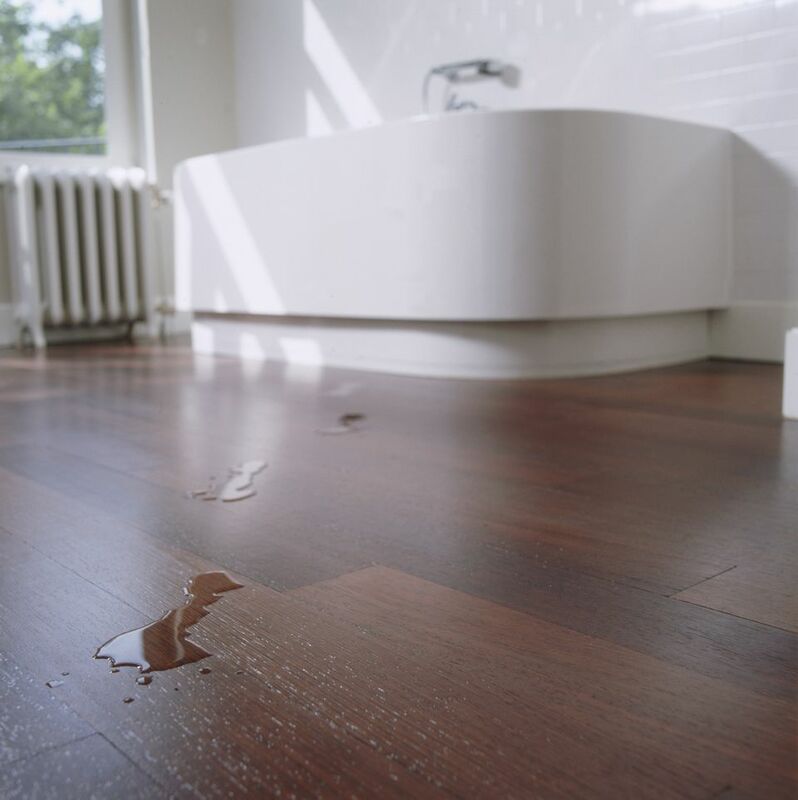 Though you may be able to undo some of the damage, flooding will generally destroy a hardwood flooring installation, even if it is properly sealed. Almost no hardwood floor can seal against a complete flood. Chemical staining: There are many different types of soaps, cleansers, and body products that are used in bathrooms. Many of these are slightly acidic in nature, and if they spill and splatter on hardwood, they can eat away at the finish or cause permanent staining in the wood. High humidity: While standing water caused by splashing gets the most attention in a bathroom, the humidity in this space can be just as damaging. When you shower, the bathroom tends to get very steamy, with the air growing warm and moist. This air will hover in the space, filling every crack, penetrating down into every tiny space, infiltrating the hardwood in your floors. While only a small amount will actually get in, over time the effects can be accumulative. Unfortunately, humidity can attack every side of the hardwood—even the bottom, which generally does not get a finish treatment. In the case of a heavily used bathroom, humidity can result in floorboards twisting, warping, plumping and cracking. Mold and mildew: Because the bathroom is so moist, the growth of mold and mildew is always going to be a problem. These harmful organic substances love hot, wet environments, and they feed on natural organic materials such as hardwood. The finishing coating will protect the floor to some extent, but over time mold and mildew can grow in between boards, and even beneath them. Regular maintenance: Keeping the floor's finish layer strong and intact is vital when you have hardwood flooring in a bathroom. This is your first line of defense, and it will need to be reapplied every few months. You can test if the finish layer is still intact by dropping a small amount of water on it and waiting to see if the water beads or absorbs into the wood. If it beads up, it is fine, but if it sinks in then you need another coat as soon as possible. Pay particular attention to cracks between floorboards. Use bath mats: These can be placed at strategic locations, such as just outside of the bathtub or around the sink. Catching any splashing water droplets or drips from wet freshly washed feet can prevent floor damage. If a bath mat becomes saturated, make sure to air-dry it so it can't hold moisture against the floor. Install tile surrounds: Another way you can prevent water damage is by installing decorative tile surrounds along the perimeter of the bathtub. These can provide a stylish match with other features of the room, but the real merit is their ability to keep water in its place—which is not on your beautiful hardwood floor. Maintain plumbing fixtures: The pipes running into and out of the major fixtures in a bathroom can also be a problem. These can sometimes leak, causing water damage problems in hard-to-see areas. Cold water lines may also collect condensation, due to being cooler than the surrounding air in the bathroom, and this can also lead to water issues. The best way to handle this is to ensure that all pipe openings are thoroughly caulked and to keep an eye out for any leaks or drips. The valve connections beneath a toilet or pedestal sink are prime places where water can drip onto a floor. Despite the obvious drawbacks, there are also distinct aesthetic advantages to using hardwood flooring in a bathroom. Warmth: One of the biggest drawbacks to ceramic tile is that it is quite chilly, especially in the winter. Since the bathroom is a space where you will often go barefoot, this can be an issue. Hardwood floors give the room a much warmer, more comforting feel underfoot. The earth tone colors also tend to make the entire room seem more inviting and welcoming. Beauty: The biggest advantage of hardwood is that it can be really beautiful. It lends a sense of natural wonder to spaces while also providing a unique appeal —every plank is a piece of natural artwork with its individual grain pattern. Hardwood is a classic choice that has been popular for thousands of years, and it isn't subject to the whims and vogues of interior design. A bathroom floored with hardwood will draw attention as an elegant space. Refinishing Hardwood Floors in a Bathroom? One of the great things about hardwood is that if you mess up and ruin the floor, it can generally be fixed by simply sanding down the surface past the level of any defects and then applying a new finishing coat to it. Be aware, though, that the equipment normally used in other rooms to refinish hardwood is quite large and unwieldy. In many bathrooms, this will be done best with hand power sanders rather than large machines, and so the process may be harder and more time consuming than you first imagine.